Senator Peterson accepts the Guardian of Small Business Award from NFIB/Ohio’s executive director, Roger Geiger (right). They are joined by Mark Fowler (left), chair of the NFIB-Ohio Leadership Council. State Senator Bob Peterson (R-Sabina) recently received the prestigious Guardian of Small Business Award from the National Federation of Independent Businesses/Ohio in recognition of his efforts to support small business issues in the state legislature. The award has been presented to only 51 members since its inception in 1988. 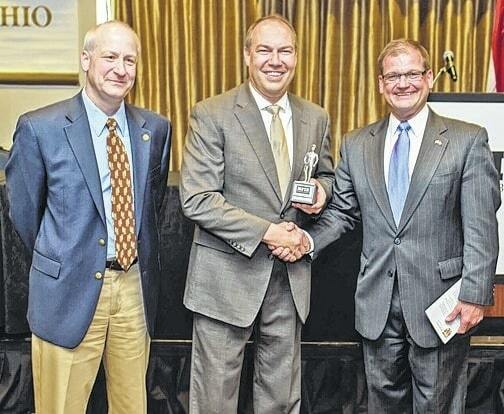 “I am honored to receive the Guardian of Small Business award from the NFIB. Nearly half of all Ohioans are employed by small businesses which are the backbone of our growing economy. It is our goal in the Ohio Senate to create an environment in this state which small businesses can thrive,” said Senator Peterson. NFIB governing board members chose Senator Peterson to receive the Guardian of Small Business Award for his strong record supporting Ohio’s small businesses. Senator Peterson’s legislative accomplishments supporting small businesses include: sponsoring legislation that returned $30 million in tax overpayments to small businesses; leading Senate effort to pass SharedWork; a proposal to reduce unemployment threats for employers; managing efforts to reform Ohio’s municipal tax laws which simplifies tax filings for small businesses. Senator Bob Peterson represents the 17th District in the Ohio Senate, which encompasses all or part of Clinton, Fayette, Gallia, Highland, Jackson, Lawrence, Pickaway, Pike, Ross, and Vinton counties. For more information on the National Federation of Independent Businesses/Ohio, visit www.NFIB.com/newsroom. Submitted by the National Federation of Independent Businesses.